Throughout his ascendancy at the Texas Capitol, Lt. Gov. Dan Patrick has proven time and again the ability to adapt to the political environment. Unlike many in the Tea Party faction of the Republican Party from which he derives his support, Patrick comes to government to govern, not to protest. As Patrick rolled out his education plans, we saw him adapt because the environment had indeed changed ahead of the special session now underway. Speaker Joe Straus has all year invited Patrick to a debate about public education – the issue that represents Straus’ surest political footing with his members – and Patrick has shifted his rhetoric accordingly. The Speaker reset the landscape in recent weeks by focusing on public education and publicizing his concerns about suicides among transgender Texans as a consequence of passing restrictions on public restrooms based on gender. Patrick quickly learned in his first session as a senator, back in 2007 when he entered government as a protester, that he wouldn’t get everything he wanted all at once. Veteran Capitol observers will recall the spectacle of Senate Dean John Whitmire taking Patrick to school when then-Sen. Patrick, at the last minute, unveiled to the media a list of cuts he wanted to make to the Texas budget. When he rose to talk about the list on the floor, Whitmire said the radio talk show host was completely unserious about his proposals, leading to quite the shouting match. “It’s high time you show this body that you know what you’re taking about,” Whitmire said angrily. In subsequent sessions, Patrick internalized the lesson that to enjoy legislative success he would first have to earn the respect of his colleagues and at times even members of the lowly Texas press corps by adapting his style and substance to meet the moment. He is, of course, always able to revert to the blustery radio talk show host persona that originally made him a hit with the base of the Republican Party of Texas. But the Patrick in last week’s news conference about public education was the Patrick who cannot easily be dismissed as an extremist, even if his math was fuzzy. It was as recently as 2013, the last session in which Patrick was a senator, that he was embraced even by some Democrats as “the new Dan Patrick” on education issues. Public education advocates who observed Patrick when he was the Senate Education Committee Chairman have said he was always extremely well-prepared and ready to do battle. The special session, now the second act in Gov. Greg Abbott’s reelection announcement, can be framed as a showdown between Patrick and Straus centered on public education with Abbott’s list of 19 items as potential collateral damage. The low talk now among some Senate Republicans is that Gov. Abbott will likely receive bills on his desk addressing 4 or 5 of his 20 items and there is no indication from the Central Office about what would have to happen for the governor to call a second special. House Democrats, badly outnumbered and weighing their options, surely know that resorting to a quorum break and creating the perception that the minority party was prevailing against Republican leadership in Texas might be the only thing that could create optics threatening enough to Abbott to provoke a second called session. 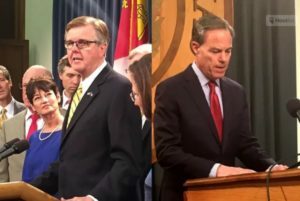 Senate leadership is moving at breakneck speed, quickly approving bills on each of the governor’s items and ceding legislative power to the House where Patrick’s poised to work to undermine Straus by calling the Speaker’s plans “a Ponzi scheme.” Shortly after the special session began, Patrick suggested Straus is a closet Democrat. Of course, Patrick said that in his natural habitat: A radio talk show. Patrick may shake loose a significant contingent of House Republicans fearful of punishment by GOP primary voters in 2018 so that he can move a strict bathroom bill and some form of property tax “reform” through both chambers. The latter issue, make no mistake, is the one most dear to Patrick who’s ridden the wave of anger over property taxes all the way to the Office of the Lieutenant Governor. Abbott is trying to appear more engaged. His meetings and photo-ops with lawmakers may be building the kind of goodwill necessary to pass a few of the 20 items, but it is work he could have done to pass similar legislation during the regular session. “If he had been doing this then, these things wouldn’t be in question now,” said one Republican. As much distrust exists between the governor and House Republicans who have never been repaid for their loyalty to Abbott during the 2015 session, they still gave him legislation on every one of the topics he designated as “emergencies” during the regular session this year. To be clear, the items on the list of 20 that now give the most heartburn to Republicans are being driven out of the Lt. Governor’s office. While Patrick works diligently, with an assist from the House Freedom Caucus, to destabilize the House, it seems Straus will still have majority support for the versions of property tax and bathroom legislation he may be willing to accept. School vouchers, rejected multiple times in broad bipartisan fashion in the House, seem as DOA as ever in any form. Facing the time constraints of a special session, an election right around the corner, and no guarantee of another special, we will all find out together how Patrick adapts to the next 30 days.